Northern Spain is one of the wettest places in Europe with an average one hundred and eighty-one days in a year when it rains. This compares with one hundred and fifty-two days in London and only sixty in Seville in the south of the peninsula. Green Spain is the name given to the strip of land between the Bay of Biscay and the Cantabrian Mountains and it is so called because it has particularly lush vegetation, due to a wet and moderate oceanic climate that is strongly influenced by Atlantic weather systems that get trapped by the mountains and turn to rain. It is a place of complete contrast to the dustiest and driest parts of Spain in the arid South-East where most Northern European visitors head for the beaches and the sun-loungers of the concrete and tarmac strip. While Northern Europe goes to the South, Northern Spain by contrast is a popular holiday choice with Spanish people living in the south and the central cities of the country because they like to holiday in the north to escape the oppressive heat and enjoy the famous seafood. 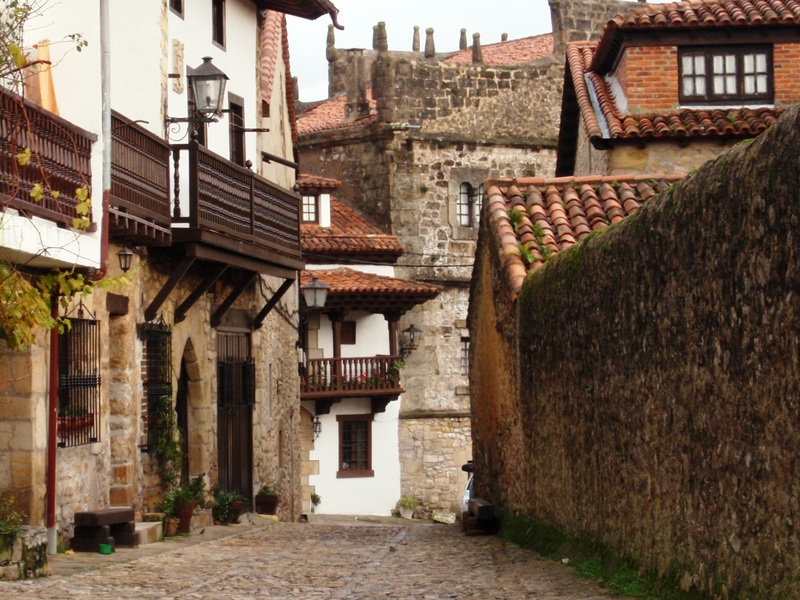 In August alone, eight million Spaniards travel north from cities like Madrid and Valencia to the more temperate climate of Galicia, Asturias and Cantabria with its green scenery and spectacular beaches. The climate though is changeable and the region is often referred to in Spain as the wet or rainy region. 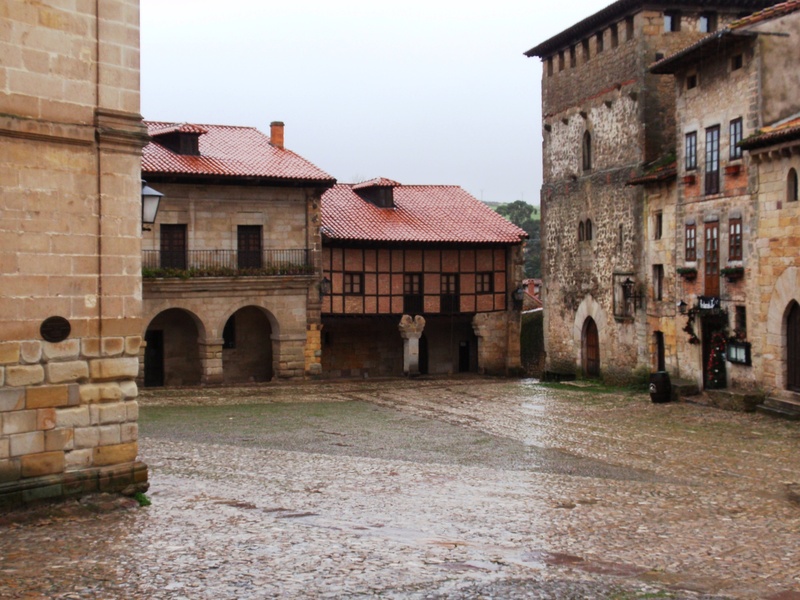 We drove east and as we did so the weather deteriorated and when we arrived in Santillana del Mar the sun had completely disappeared behind a curtain of grey sky. We parked the car and walked into the town that turned out to be a real treasure. 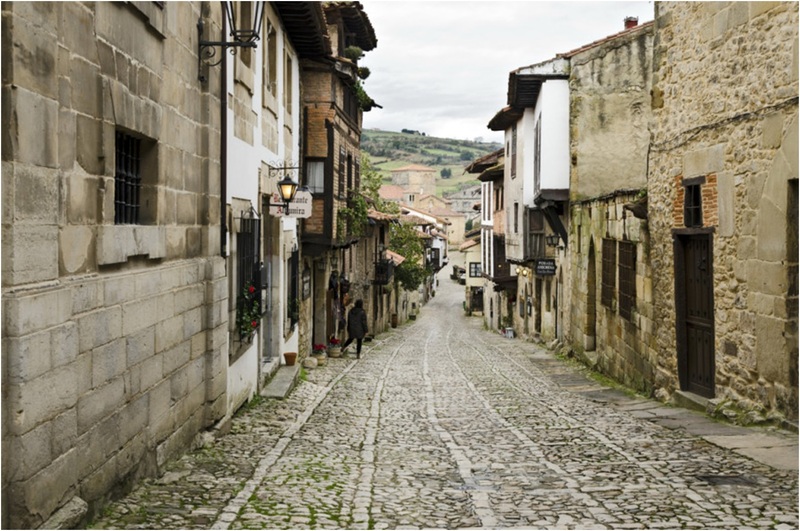 It was an unspoilt medieval town with a famous old church and cobbled piazzas and historic old buildings at every twist and turn in the streets and in fact the town is so aesthetically perfect that it has been declared a National Monument of Spain. Next morning the weather proved to be another disappointment, I could hear rain on the window as I started to stir and when I did the weather check I could only report back that the sky was grey and it was drizzling. At breakfast our host confirmed the worst and informed us that the forecast was gloomy all day so we decided that it was probably a good day to go and do something undercover and perhaps visit a museum. After breakfast we headed back towards Santillana Del Mar and then followed signposts to the Altamira museum on the edge of the town. I wasn’t expecting a great deal to be honest so was surprised to find a very big car park and a large building built into the hills. 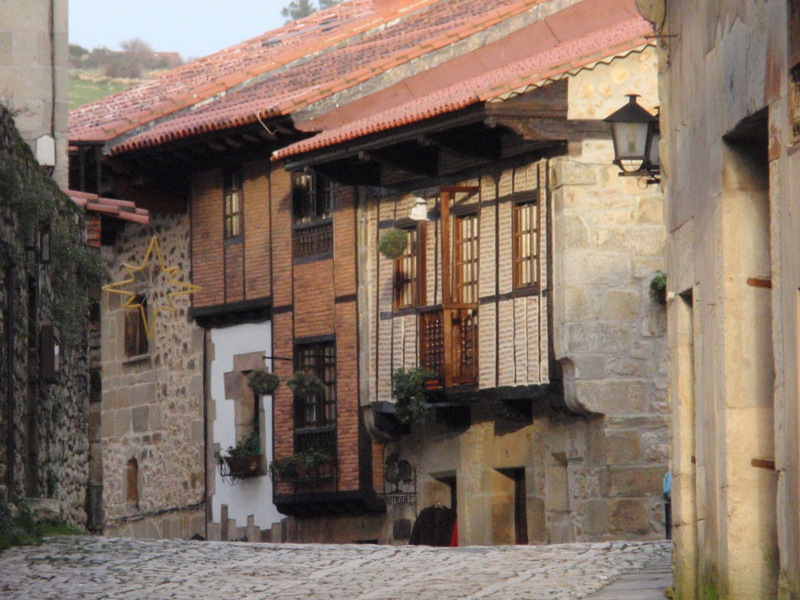 I was about to learn about something else that I was completely unaware of – Cantabria is the richest region in the world in archaeological sites from the Upper Paleolithic period (that’s the Stone Age to you and me). The most significant cave painting site is the cave of Altamira, dating from about 16,000 to 9000 BC and declared, with another nine Cantabrian caves, a UNESCO World Heritage Site. Well, you learn something new every day it seems! Around 13,000 years ago a rockfall sealed the cave’s entrance preserving its contents until its eventual discovery which was caused by a nearby tree falling and disturbing the fallen rocks. The really good bit about the story is that it wasn’t discovered by Howard Carter, Tony Robinson or Indiana Jones but by a nine year old girl who came across them while playing in the hills above the town in 1879. Her father was an amateur archaeologist called Marcelino Sanz de Sautuola and he was led by his daughter to discover the cave’s drawings. The cave was excavated by Sautuola and archaeologist Juan Vilanova y Piera from the University of Madrid, resulting in a much acclaimed publication in 1880 which interpreted the paintings as Paleolithic in origin. So well preserved were the paintings however that there ensued an argument about authenticity and some believed the whole thing to be a hoax and it wasn’t until 1902 that they were accepted as genuine. We paid the modest entrance fee of €2.40 and went into the museum, which turned out to be a real treasure with interesting displays about the Stone Age, or the Paleolithic period if you prefer, with the highlight of the visit being a full size recreation of the original cave and its precious paintings. Today it is only possible to see this copy because the actual cave is now closed to vistors. During the 1960s and 1970s, the paintings were being damaged by the damp breath of large numbers of visitors and Altamira was completely closed to the public in 1977, and reopened with only very limited access in 1982. Very few visitors are allowed in per day, resulting in a three-year waiting list. It would be nice to go into the actual cave but actually the replica allows a more comfortable view of the polychrome paintings of the main hall of the cave, as well as a selection of minor works and also includes some sculptures of human faces that cannot be accessed in the real thing. And, let me tell you, these people were good painters. The artists used charcoal and ochre or haematite to create the images, often scratching or diluting these dyes to produce variances in intensity and creating an impression of remarkable and sophisticated contrasts and they also exploited the natural contours in the cave walls to give a three-dimensional effect to their subjects. The painted ceiling is the most impressive feature showing a herd of bison in different poses, two horses, a large doe and a wild boar. Other images include horses, goats and handprints created from the artist placing his hand on the cave wall and spraying paint over it leaving a negative image of his palm. Numerous other caves in northern Spain contain palaeolithic art but none is as advanced or as famous as Altamira.